CNG: Printed Auction Triton XXII. CAMPANIA, Neapolis. Circa 300 BC. AR Nomos (20mm, 7.43 g, 10h). Artemi(os), moneyer. Triton XXII, Lot: 3. Estimate $5000. Sold for $13000. This amount does not include the buyer’s fee. CAMPANIA, Neapolis. Circa 300 BC. AR Nomos (20mm, 7.43 g, 10h). Artemi(os), moneyer. 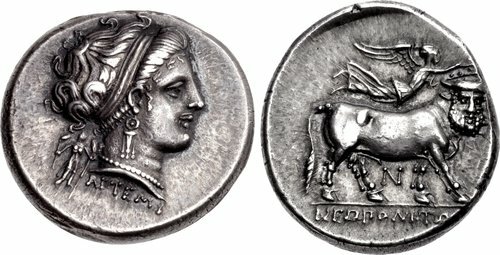 Head of nymph right, hair restrained in wide band, wearing triple-pendant earring and pearl necklace; behind neck, statue of Artemis Phosphoros standing facing; APTEMI below / Man-headed bull standing right, head facing; above, Nike flying right, crowning bull with open laurel wreath held in both hand; N below; NEΩΠOΛITΩ[N] in exergue. Sambon 460b; HN Italy 579; SNG ANS 342; SNG BN 779 (same dies). Choice EF, wonderful cabinet tone. From the Gasvoda Collection. Ex Waddell inventory 51491 (August 2014); Star Collection (LHS 102, 29 April 2008), lot 3; Sotheby (7 July 1996), lot 25, from an unnamed collector who acquired the coin from P. Strauss, 1954.